The markets are floating neutral to higher today on the back of light volume and continued global optimism. Last Friday, the Non Farm Payrolls Report showed a rosy picture of the job market. Being the first Monday of the new quarter, it is likely to see new mutual fund money keep the markets flat to positive as well. The SPDR S&P 500 ETF (NYSE:SPY) is trading at $133.23, +0.08 (+0.06%). Apple Inc. (NASDAQ:AAPL) is trading lower today at $341.20, -3.36 (-0.98%). Last week, Apple could barely catch a bid as the markets rallied higher. It appears as if large investors and institutions continue to be on the sell side of Apple. Worries about Steve Jobs, the companies growth rate and competitors continue. Amazon.com, Inc. (NASDAQ:AMZN) has been a monster over the last two weeks. 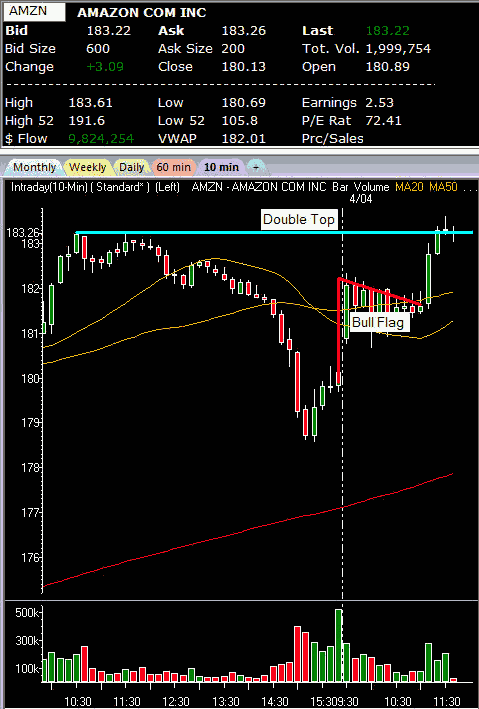 Just today, a classic bull flag played out with Amazon spiking to Friday’s double top at $183.25. Note the chart below. Last week, Amazon unveiled a music cloud program and was upgraded by an analyst at Morgan Stanley. On March 23rd, 2011, Amazon was trading at $160.82 and now it sits at $183.32, +3.19 (+1.77%). While the stock is short term extended, it has been extremely strong. The Dollar is hovering around the flat line today as commodities are spiking once again. Gold and silver are having solid days as buyers continue to pile in on fears about currency oversupply leading to massive inflation. The iShares Silver Trust (NYSE:SLV) is trading at $37.50, +0.64 (+1.74%).